LIFE OF A BRAHMAN | Universe is just a Thought ! Carlos Castenada often used a term ‘Sorcerer‘ in his books which means a person who is always connected to the Source.That term can be best used to describe a Brahman.The three gunas or qualities-Sattva,Rajas & Tamas are found in every human in different proportions.Brahman is one of the four class of people who is inclined to have the Sattva guna in highest proportion.Brahman,basically,adheres to the principles of Vedas,the foundations of Hinduism.His primary duty is to practice Dharma.Everything in daily life of a Brahman is a ritual. When the Aryans arrived in India three thousand years ago,the long-established Indus Valley Civilization was on the verge of extinction.After many years,at the time of the Gautama Buddha,Brahmans held a prestigious position among all sects.They were mostly priests & teachers,who were primarily engaged in attaining the highest spiritual knowledge. A Brahman lived an ascetic disciplined life,receiving the minimum necessities of life by spreading & teaching their philosophy.Religious rituals in temples & homes of Hindus had to be performed only by a Brahman. It was believed by everyone that Brahmins held a sacred knowledge which they kept secret among themselves.They were considered to be the ones who were closest to God or more of a liason between a man & God. This was one point which Gautama Buddha could not accept.He felt if we all are children of God,then everyone should have the ability within to seek the absolute truth.He himself being a Kshatriya, took out on his quest for the ultimate truth.In the end when he was enlightened,he taught his philosophies to others which is now practiced as Buddhism in different countries. But why was it believed that the ceremonies & rituals could only be performed by Brahmans?What was that sacred knowledge which Brahmans held secret at that time.This question drives my attention.Brahmans believed that if a certain knowledge is kept secret, it becomes more potent. OM Let both of us protect each other.May both of us enjoy each other.May both of us work together.Let our study become radiant.Let there be no hatred between us. Today in modern India, the situation of Brahmans is worrisome.The community of Brahmans has seen a steep downfall in recent years mainly due to unsatisfying greed & vested interest of many political leaders.Brahmans living in the village are suffering from extreme poor conditions,while those in the cities have lost their spiritual magnificence & wisdom and have taken to over-indulgence of sensual pleasures. The secret knowledge which was their primary asset has been lost somewhere down the line. For any society to make a progress,a balance has to be maintained.A modern Brahman must remember that his strength lies in his spiritual knowledge & as a Brahman,his motive should not be that of mere personal gain but to work for the welfare of society as well. Hi friends,I'm 22. A Mechanical Engineer(ooops!) who Loves playing Guitar,traveling & wild adventures,listening to Rock (let's keep it alive guys). More importantly, I've found out some truths about this crazy thing called LIFE but I often don't find the right people around me with whom I can share these truths.You may be the One I'm looking for. After all,an Enlightened Being would always want to share LOVE with humans from every corner of Earth. 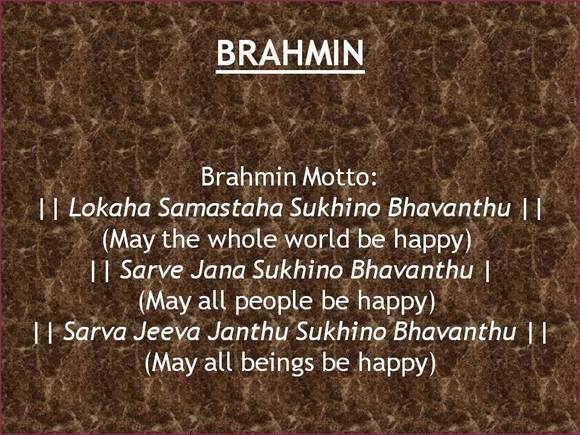 This entry was posted in Writing and tagged Indian Brahmin. Bookmark the permalink. I am with Buddha here. The caste system in sanatana dharma may have started innocuously as division of labour, with equal importance to all forms of work. However, it lost its ideals along the way and divided society, relegating certain categories of work and people associated with it to a lower plane. The eight fold path enunciated by Buddha treated all human beings as equal and focused on eliminating desire to attain a balanced life; it is by far the best spiritual document. It is a fact that the Brahmins felt threatened with the popularity of Buddhism as they had a vested interest in perpetuating the caste system whereby they could enjoy superior status and get other communities to do all the work as per their diktats. Hence they were all along opposing some of the deficiencies in Buddha’s teachings, like its total silence about god. Centuries later, the movement received momentum with the advent of Shankaracharya and his philosophy of Advaita. Brahmins along with host of others rallied behind him to weaken the influence of Buddhism. It is also a fact that Advaita gained ground because of the missionary zeal of Shakaracharya in spreadimg his philosophy travelling the length and breadth of India. The Brahmins merely aligned behind him rather opportunistically only because they considered their interests safe under him. In conclusion, there is nothing special about the Brahmins as a community. Even the gods, barring few exceptions like parasurama, chose to incarnate in other castes in their various avatars.